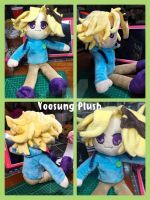 He was quite fiddly to plush with all his accessories and like Zen, a big messy mop of hair xD. Regardless, I still had a blast making him. My favourite part was working with all those bright and vivid colours. Also there's the commission opening that I've been promising everyone... LOL! There's been a lot of interest in these dolls, but I suspect a lot of the demand will die down once I announce my pricing. Just some food for thought, I put a lot of effort and time into these dolls. 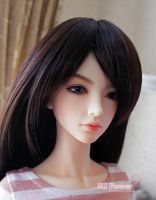 Each doll takes at least 30 hours to design and sew, so the pricing will reflect that. I'm thinking at least $300-400NZD depending on complexity. If there's too much interest for one character, I will need to do a random draw. On a totally unrelated note - my BJD from Iple House has arrived! ^___^ I'm going to go debox her tonight! I hope my BJD boys will be done soon too (before the Christmas rush!)!! 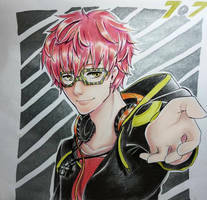 Seven is so cute, I love the plush version of him that you made. All your plushies are so cute! the meme lord hacker god has appeared! Another winning design. I love everyone's SHOES. lol, and the fact they look so soft and have awesome hair. Ahaha~ finally got the commision pricing. Out of my range as expected, but understandable. I would totally commision V if I could lol. Then again I think I'd rather make a big (but simple) plush/pillow hybrid thing. I'm just super jealous of your embroidered faces! If I get more MM photos done, I will probably finally make use of my dA account lol. I hope you post a photo of all of them together! And congrats on your Iplehouse bjd, that company is awesome. I have a pair of awesome 1/3 cargo pants from that company. They are so good at realistic stuff ! Thank you so much! I'm so happy you like him! ^______^ I initially wanted to plush chibi humans with very simplified features including hair... but as I got plushing, I couldn't resist adding details... so it ended up being a lot more labour intensive than anticipated ^^" thus the pricing >.< sorry sorry! But yes, omg, I had a look at your BJD, gorgeous! He really resembles V! Nice job!!! I love those shots! You really should do more MM photos and post them on DA!!!! So exiciting! wordpress told me you stopped by. I'm so happy~! thank you for the kind words. It makes me happy to see other fans approve of doll V haha. Hehe, I'm looking forward to more pics! And thank you so much for following me on wordpress yea, I don't play the game much anymore either :< but I plan to replay it some time! The fandom really keeps my interest up though, with all the fanart etc. And thanks so much for liking my girl my iplehouse boy is in transit to me as we speak... so hopefully I'll post more bjd related things soon hehe. LOL! Yes, will be making Saeran! Not sure about the other two though... hahahahah ^^"
but I would need all of them!!! ohman if I had the money to commission them I so would order one of each of them! Thank you so much!!! x) I know! I'm leaning towards Jisoo at the moment... but Jiwoo would make such a cute plush!!! >.< tsundere goodness! I know!!! I'm actually having a hard time deciding! I'm sure you did too when drawing Jisoo? I think for Jisoo I much prefer his street wear, but for Jiwoo I preferred his fancy wear... if I want to keep everything consistent, I'd do both in their fancy wear. haha i'm sure you will have fun with it and they will turn out awesome I am very excited to see them when they are done! !